The third time now, it has rained on me when I ventured into Kensington Market, which is bad news because there are (apparently) still about 2-3 others “best of’s” therein. 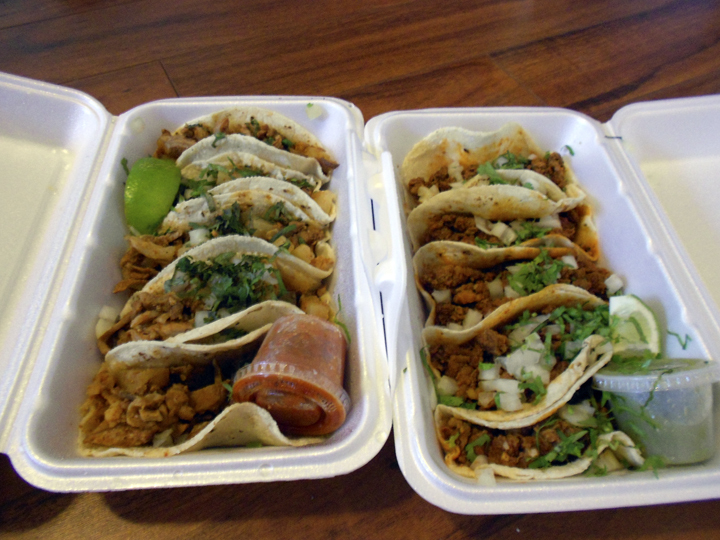 We went to El Trompo to grab best Mexican for takeout (backlog of TV to catch up on now that everything is almost back in swing). Brent found an old takeout menu online and we made our decisions based on that. He called the number provided and afterwards he tells me that he was not even sure if it was the right place he called. They never said the name of the place when answering the phone and had not asked for his name or number. It was raining and we were without an umbrella so we had to hurry it up in walking there. And the food was ready much faster than we had anticipated. Getting it to go, we did not get to sit down in the restaurant and eat it, of course. It was a small place and very Mexican looking in it’s decor and atmosphere (as far as I can tell, never been really). They even had a bowl of limes by the cash register. On the way to Brent’s house we also made a quick pit-stop at the Wedding Cake Shoppe where I could buy yet another cupcake for my book. Being the end of the day, there was not much selection left. 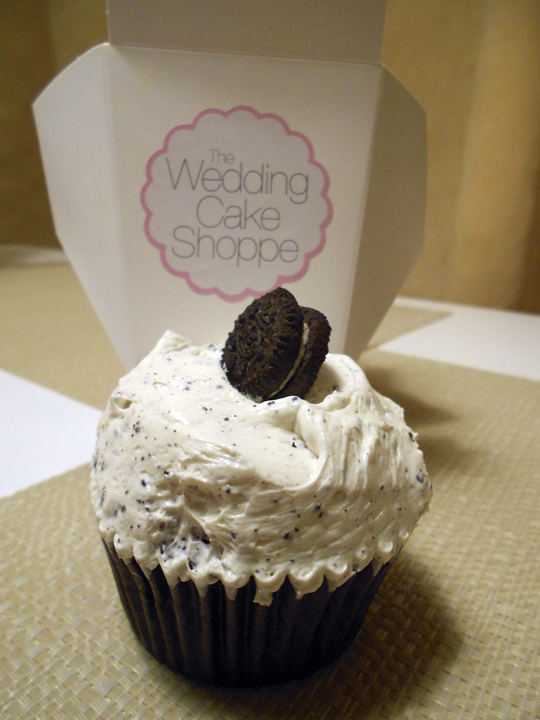 However I lucked out, because they still had a few cookies & cream cupcakes. I had not had one in over a year, since the cupcake shop in Cape Cod drew me in with it’s hilarious name (CupCapes of Falmouth). The other reason we were getting takeout was because Brent’s fridge was being replaced and his roomies were not home, so it was up to me & him to be there to empty out the old one. Doesn’t sound so bad does it? It was. I played more than a few rounds of “I can’t even tell what this used to be” which was not just reserved to fruits & veggies. There was the absolutely disgusting coffee pot of fruit juice. At first glance it looked perfectly normal, but it belonged to Kyle. The very same Kyle in whose car we found a thermos of rotten milk and mold in the coffee filter. Brent spilled it in the sink and to my horror, I saw, congealed chunks of fruit punch! It looked like a low-budget horror flick in the sink. Having (somehow) not lost my appetite after that mini-adventure we settled down to eat. Brent ordered the house specialty, tacos Al Pastor (pork with pineapple bits) while I went for something more “traditional”, chorizo sausage tacos. Each one came with a small container of sauce. One was green, one was red. We assumed that it was guacamole and salsa. We were wrong. They were both hot sauces of some sort. It proved hard to dip the taco into the sauce without destroying it and losing the precious contents to the sea of sauce. And the verdict? I made the better choice (don’t listen to what Brent says). Sausage bits go well with hot sauce. Pineapples, they do not. The pineapple bits kept falling out, back into the styrofoam container… and I was not picking them up and putting them back into my taco as I had been with sausage bits and even a few onion bits. I had always though of tacos as being that what you see in Taco Bell commercials, rife with beans and sour cream, thus I never indulged. And it is a good thing, for I don’t think I would’ve enjoyed them (I hate beans, even jelly beans) and thus would have been reluctant to try El Trompo. The tacos were served on soft shell, and it blew Tacos El Asador’s soft shell tacos out of the water! All that meaty, spicy, savoury deliciousness left me with a horrid sweet craving. I resorted to swiping a bit of icing off the inside of the box containing my cupcake. It was bad, I kept fidgeting and wanting to eat the cupcake. Eventually Braeden (unwittingly) came to my rescue! He came home with a pizza box… full of decadent brownies… that had Smarties bits on top… and chocolate chunks inside! (NOTE: this just kicked off another horrid round of sweets craving, dammit all). Eventually I got to indulge my (already satisfied) sweet tooth on the cupcake. There was another reason why I went back to Wedding Cake Shoppe (other than it being along the way). I had their cupcakes a long time ago, back when this whole “best of food” thing had started. And I remembered quite liking the lavender cupcake I had. When I was on the website looking over their cupcake selection, I noticed that they were ALL made with butter-cream (except for a chocolate topped truffle cupcake). This made me wonder, was Bobette & Belle’s (and a few others too) butter-cream just not made right? Or did I used to like butter-cream? Was the lavender cupcake not made with butter-cream (it’s not listed on the website, so I will never know). It turns out that there is a reason why Wedding Cake Shoppe was voted best cupcakes in the city. Their butter-cream is so light & fluffy that it barely even registers as such. I was wary of how much icing was on the cupcake, but due to it’s lightness, it was just right. Another Monday, another 3 hour break. Again, I decided to venture out and get something done. I walked to the Toronto Archives to drop off a necessary form and I thought, heck, while I am this far north, may as well go further north. I was a few streets south of St. Clair and so I thought why not go there? Afterall I had been meaning to go to The Cupcakery and if I just so happened to pass by The Stockyards, I could get my pulled pork fix. Close to two hours of walking, in unexpected heat… and The Stockyards was closed. Another 20 minutes… and The Cupcakery was also closed. So I headed back to class, hungry and defeated, where I looked up two other possible cupcake options for the day. But, nope. For The Love of Cake is also closed on Mondays. I had only one option, Dlish. And when I got there, almost at closing time, all they had were either flavours I’ve already had or ones that were too plain for my book. 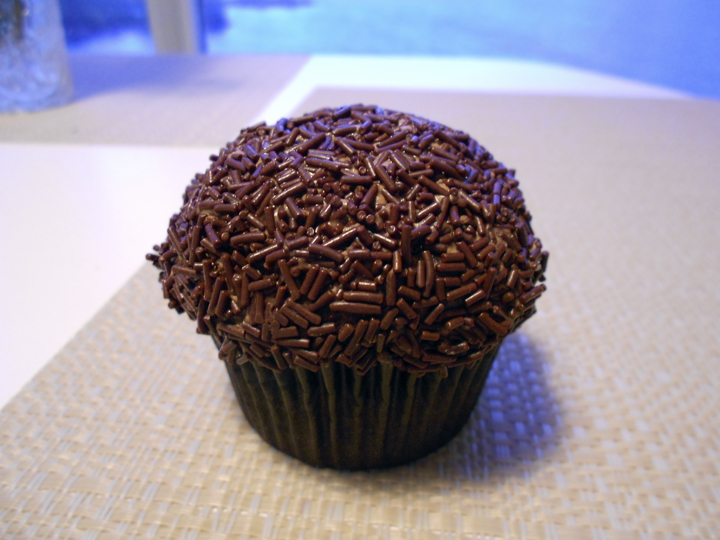 So I settled for a dark chocolate cupcake. While sitting at the streetcar stop waiting, ants tried to get at it too. The cupcake was surprisingly delightful. The dark chocolate gave it that rich chocolatey taste without making it overly sweet and the icing on top was very light and creamy. I also loved the sprinkles on top. It made my day. After my lousy pierogi experience on Roncesvalles I was a tad wary of going back, especially so soon. But I manned up and went. Having Kyle there helped plenty as well. At first it was a little bit awkward, we walked in and no one really seated us. We had to go all the way to the back to a small table. I made eyes with a waitress a few times, but to no avail. Kyle went up to the bar to get menus for us. 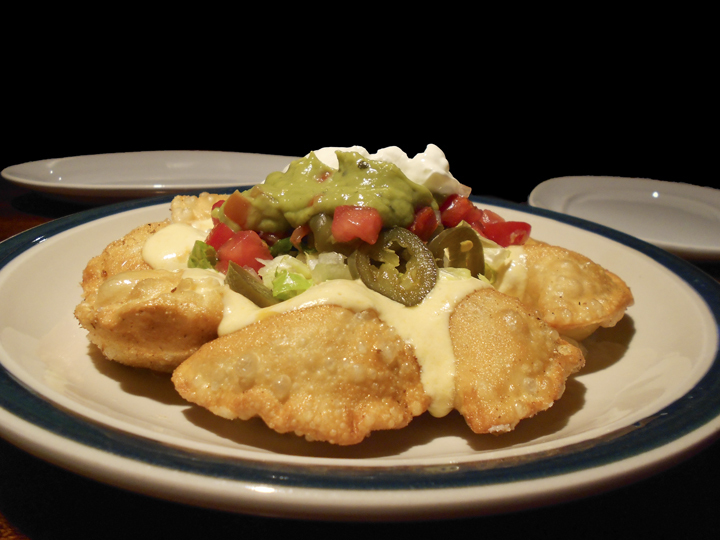 It was settled before that we were all going to split a plate of nacho pierogi, which is what InterSteer is known for. But glancing over the menu I saw that they also had pan-fried pierogi, which by all accounts are amazing and a great way to eat day-old pierogi that you don’t feel like microwaving. Our food arrived promptly and again, it was beautifully arranged. Apparently for Poles, the pierogi dish is as much about presentation as about taste. The plate was piled with pierogi in a circle, topped with: sour cream, liquid cheese (sounds gross, but was good), guacamole, lettuce, tomatoes and the clincher: jalapenos! Being a mild foodie and all, I grabbed a pierogi with my fork and then piled as much of all the toppings on top as I could, Brent helped and piled on some more. I ate tomatoes, I ate jalapenos. But ooh man, the jalapenos. So good! I was sure my tongue would fry yet, not so, I could’ve even had it a bit hotter (I assume it was the sour cream tamping it down?). The pierogi themselves: amazing. I managed to get a clean bite without toppings and ooh man they were good. The outside was really cripsy a-la pan-fried and they were not frozen on the inside! The contents was potato and I believe also some cheese. The potato was smooth and not lumpy, and the cheese was barely discernible, which is good because I usually do not like the cheese they put in pierogi, except for American-ized perogies with cheddar cheese, which these were not. Good eating was had and I do want to go back to InterSteer because they also had on their menu this wonderful doozy of a dish: Polish sausage on a bun… with pulled pork atop that!! I wish I had been more hungry Friday night, or that everyone else had also been more hungry. I also had a great kick out of laughing at Brent’s (cute) attempts to speak Polish to our waitress. His biggest success was ordering a beer, Tyskie. That was the easiest to pronounce. The atmosphere at InterSteer was as good as the food. There was a pool table in the back and a jukebox (but you had to pay to request songs, we lucked out that the other patrons had good taste). I agree, best perogies in the city. BUT. They were not Polish, so that category is still open. I am hoping to go to Cafe Polonez and try their pierogi, given that is an actual restaurant, not a pub/tavern. 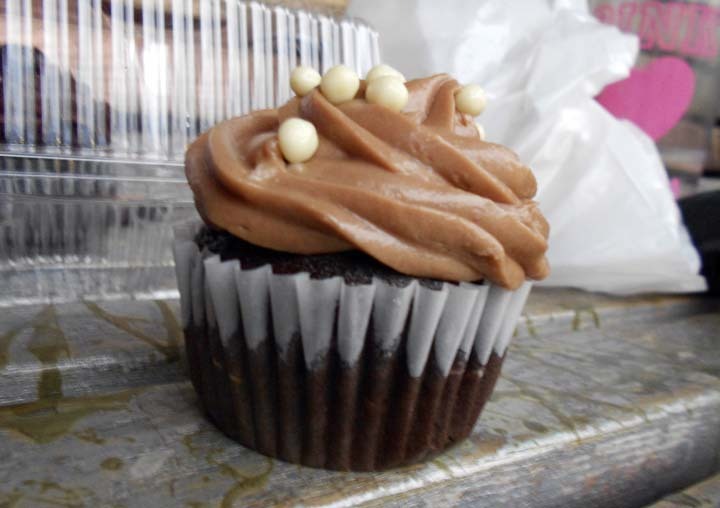 It seems that lately every time I head to Kensington Market for cupcakes I get rained on. That has happened twice this week. Twice! Not enough to stop me, mind you. I had my super destroyed umbrella! It was barely enough to cover me as I walked to Brent’s work, let alone the two of us as we both tried to cram under it for shelter. Our first stop in Kensington was the best bulk food store, Casa Acoreana . It was OK, not even close to the best though! It had a rather small selection and it was kind of hard to figure out how exactly things worked there. Some things were behind the counter and we had to get the guy to scoop it for us and when I wanted to get coffee, a nice old man handed me a scoop from the counter. It was all very old-timey, all it needed was some barley spilling out of a burlap sack. I still think the bulk food shops in St. Lawrence Market are better. 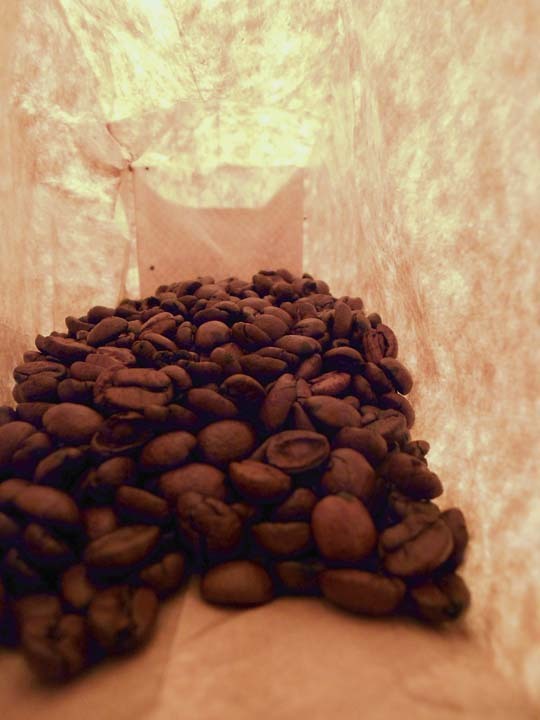 It was nice that they had cinnamon hazelnut coffee, of which I have not partaken in since my days at Second Cup when I would go looking for it in the cupboards and open it up as our feature flavour, to much grumbling. How can no one else like the flavour of it?! It tastes like cookies! With caffeine! Our next stop was the best cheese shop, Global Cheese. Not being a cheese person, I was really at a loss in the store. Aside from grilled cheese, pizza and french onion soup, I don’t really eat cheese. Even so, I will only eat it if it has been melted. 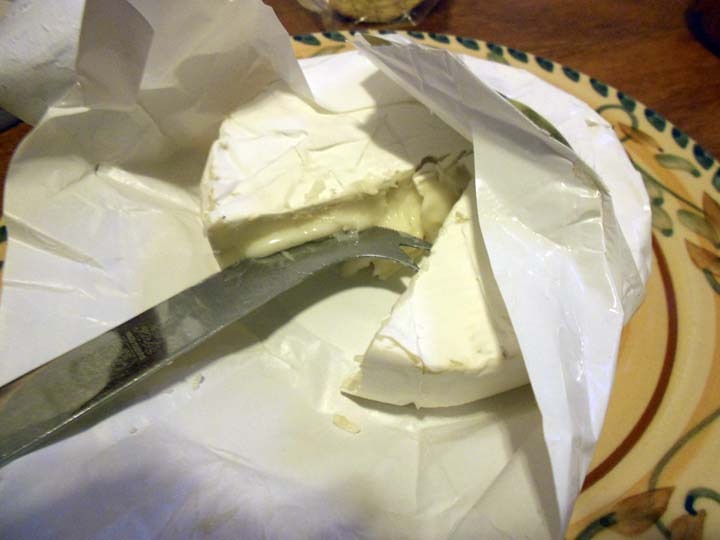 Brent bought some oh-so-delicious-sounding goat’s milk brie (what’s not to love about those three elements?!). From there it was a quick jaunt across the street to Miss Cora’s Bakery where I would finally get my cupcake fix! Alas, there were no cherry pisatchio cherries. It was also deafeningly loud in there this time around. I guess it was closing time and they were finishing up. Either or, we sort of had to shout our orders. For lack of dinner plans, and curiosities sake, we also got some pizza. I say curiosity because the pizza toppings consisted of stir fry items and the other slice had goat’s cheese (I know, again with the goats!). The pizza was (surprisingly) good. The stir fry actually tasted like I was eating stir fry with a pizza crust underneath, and for good measure, Brent managed to pull a carrot out from under the other toppings. A carrot slice on a pizza. 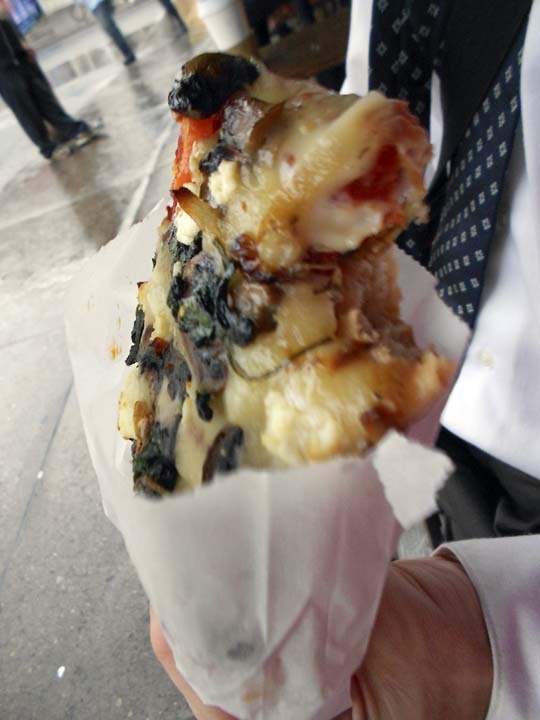 The goat’s cheese was barely discernible (a good thing) although it had a funny texture that thankfully got drowned in the rest of the pizza toppings. And the cupcakes? Well cupcake. We bought two, one chocolate and one mocha, but I had to take the mocha home to my make-shift table-top studio. So we split the chocolate one. It was pretty good, I liked the crispy things on top. The icing was thick and creamy and the cake part tasted good on it’s own. Was it absolutely remarkable? Did it make me scream out loud (like that smores one did)? Nope. Still tasty, but not the best I’ve had. They also get lots of props for giving me a plastic container to transport my cupcakes, the kind that grocery store cupcakes come in. Needless to say, I have not thrown it out. It is a God-send. On our way, in the pouring rain, we stopped at Metro to get some crackers, you cannot eat goat’s brie on it’s own, that would be gross. Well, not true. Even on a cracker it tasted like old moldy plastic and stale rubber and feet (well, what I imagine these things taste like). I have learned a lesson, venturing out of my cheese comfort zone is not a good idea. There were also some cutting the cheese jokes while we ate fancy cheese on the floor and watched Breaking Bad. So classy. NOTE: we also passed by Wedding Cake Shoppe and I saw that they were still open and I was *this* close to going in, but I resisted. It took all my willpower. Thankfully it was raining and I was drenched and cold. Today I happened to be heading downtown and so I figured on my way home, why not grab a cupcake? So it was decided, I would stop in at Bake Sale for some snackage. I went on the website beforehand to make sure I was not wasting my time going somewhere that only has chocolate and vanilla cupcakes. And man alive was I surprised! The website listed as flavours: lemon, Boston cream AND cookies & cream cheesecake! Three possible cupcakes! I was psyched, I mean really psyched. Custard! In a cupcake! With chocolate!! I got there and was a little alarmed, for a split second it looked as if my choices were chocolate or vanilla.. and then I saw it. Lemon! I promptly ordered one and then as I was paying I noticed some more cupcakes in what I think was a fridge and I asked if she had any Boston cream cupcakes and the nice lady informed me that they had not made those ones in a long time. Ah well, only a reason to go back there. 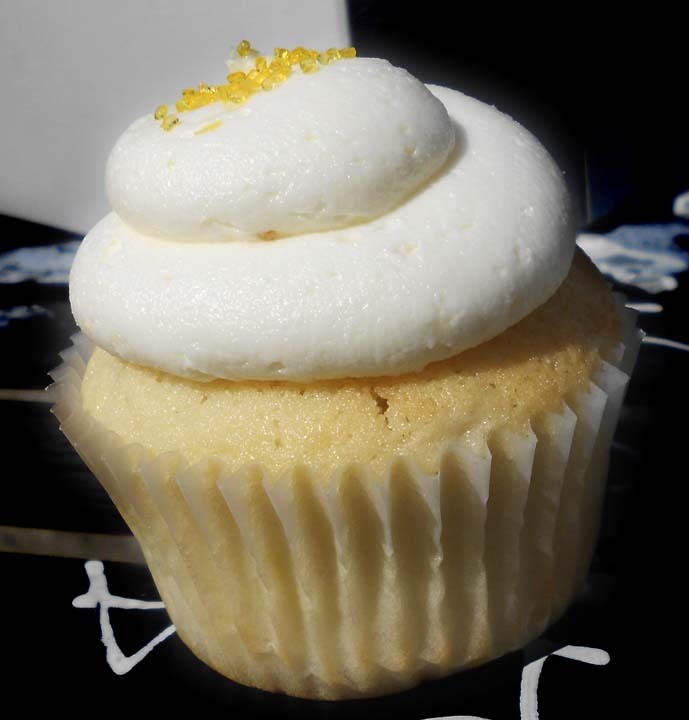 The cupcake itself was a little bit more dense than what I am used to, but because it was lemon cake it was more akin to a lemon pound cake, so in this case the denseness worked. It was very good cake, the lemon was not too much and it was not fake in it’s taste. I do have a point of contention with the icing though, it was a touch too sweet, especially given it was lemon. It did taste of lemon, but more like sweetened lemonade. It was still a good cupcake and I will be back there for the Boston cream, maybe my asking will have sparked some inspiration and they will bake a batch? Damn, I should’ve given her my number so she could call me in the event they do whip some up. On Mondays I have a three hour break between classes, so what else was I to do other than wander around downtown? And of course where else will wandering lead me than to… CUPCAKES! In my defense, I was just doing my work. I ended up at Prairie Girl Bakery. There treat of the week was a pumpkin spice cupcake with either vanilla or chocolate icing on top. 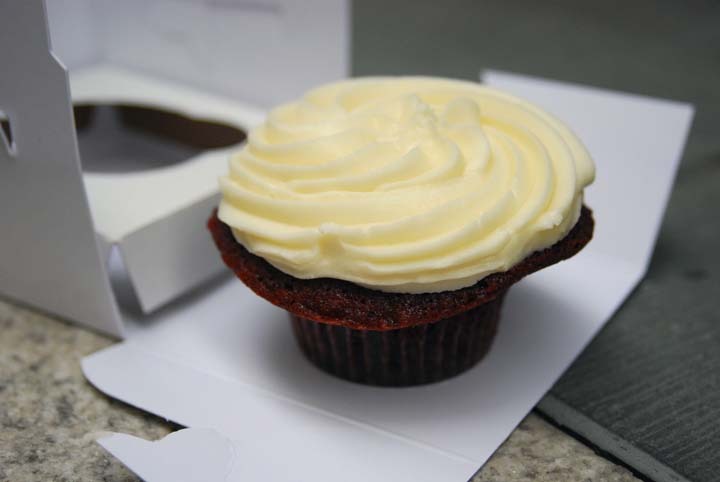 Having already had a pumpkin spice cupcake over the weekend, and for lack of repetition in my book (save for the fact that every page will feature a photo of a cupcake) I went for the good ol’ Red Velvet. I must admit, it has taken me a while to come around on red velvet (especially after I found out that the red colouring comes from beets, why not cherries? Raspberries? Strawberries? Why beets?! ), especially the cream cheese icing. But especially in comparison with butter cream icing as well as some other diabetic-coma-inducing icings I have encountered, cream cheese icing is really starting to grow on me. In terms of on cupcakes, because I have been eating that as crepe filling since childhood. So how does Prairie Girl’s red velvet cupcake taste? Delicious of course, really what else could you expect? The cupcake was very light & fluffy and just fell apart, in a good, freshly-baked kind of way. The cupcake batter had been generously poured, for the cupcake spilled out with a giant muffin top. Largest one I have encountered to date. It did make taking it out of it’s safe-haven box a little difficult but so worth it. That is the other plus for Prairie Girl. 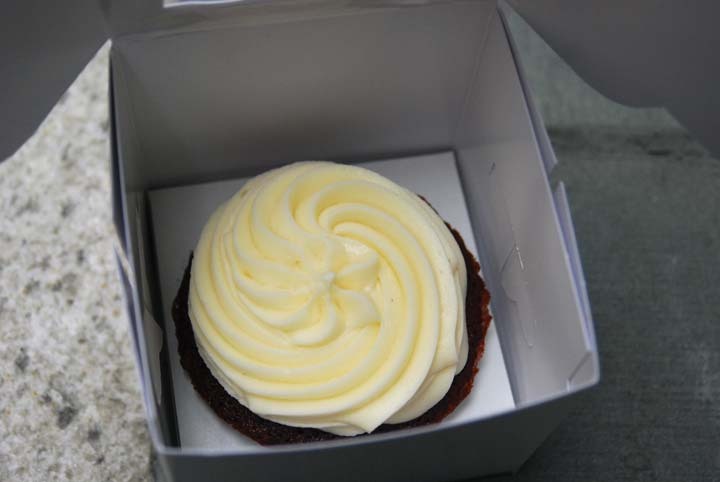 They have a special box for the cupcake with a hole cut out so the cupcake stays in place while it is transported. And it stands the test of time. That cupcake, in it’s box, lasted through 6 hours of transport and some horrible rain. It took all my will power not to eat that cupcake. A whole day! 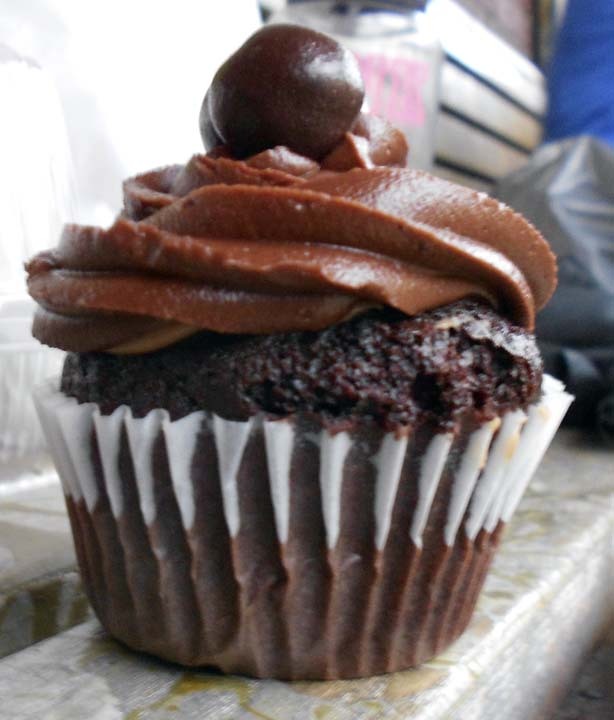 A whole day of carrying a tantalizing cupcake! Every once in a while the box corner would pop open and I would get a whiff of it, ooh it was to die for. Today was a family-oriented day. We headed out to the Polish festival happening on Roncesvalles. Being that there were four of us in total trying to get ready and out the door, it took a fair bit of time. Having barely eaten anything, in anticipation of eating some good Polish grub, I was voraciously hungry by the time we got there. (Biking there, so did not help with the hunger pangs, also biking in jeans=awful). It was decided we would go to Chopin Restaurant, and by decided I mean I got vetoed and outvoted. Hell bent on having some good perogies I did not complain too much about the decision for I remembered Chopin still appeared on the best perogies in the city list. However when we got there, we had to wait. It was a good 15 minutes of standing and watching smaller parties pass us because there was only room for two people or so, but finally we were led to our table. It did not take us long to decide what we were having. Thankfully Lucy was also ordering perogies so I would be able to try two different varieties, meat and cabbage. We then waited a long time before any food came out. By long, I mean 30 minutes. Camilla’s and my mom’s dishes came out first, not surprising given they ordered the same thing, breaded pork chops. Another ten minutes and the waitress brought out Lucy’s plate of perogies. I sat there. Hungry. No food. I had resorted to eating off my mom’s plate, stealing bits of pork chop and when Lucy’s plate came I made an offer of trading some of my meat perogies (you know, if they ever arrived) for some of her cabbage ones. And finally! Lo and behold, a giant tray of perogies for the hungry one! Oh how I rejoiced! They were so nicely presented! I was so hungry! And then I bit into one. It was half-frozen in the middle. It was the (Polish) store-bought kind, I am about 94.5% sure of this. Not that those perogies are bad, but I can eat those at home. Hell, I spent a good half my childhood eating those. And they do not hold a candle to truly homemade perogies (my mom’s especially). If I am going out to a restaurant to eat and then having to wait half an hour for my food, I at least expect it to be of great quality. I even found a cheese perogie hiding among my meat ones. I did not complain or send them back because 1.) I was hungry, 2.) I did not feel like spending another half hour in there waiting some more and 3.) it was supposed to be a nice Sunday afternoon dinner and I simply did not wish to spoil it. 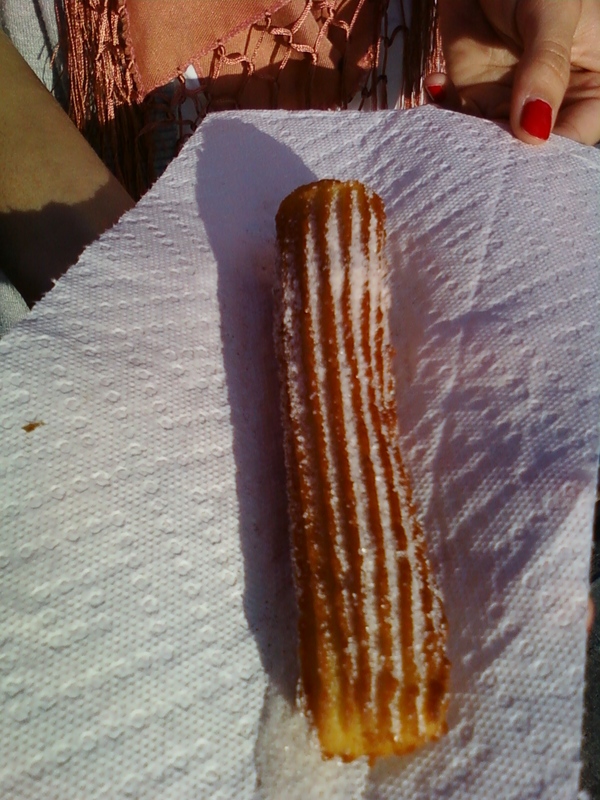 On our way home I could not resist stopping to get a churro. I indulged in a Spanish treat only because Granowska’s was sold out of pączki (what do you expect at almost 6 in the afternoon on a Sunday during a street festival?). It was OK, tasted like cake-type confection. Now I know, curiosity abated.